The Book Of The Dead was not only a guide to the life hereafter, wherein they would join their friends in the realms of eternal bliss, but gave detailed particulars of the necessary knowledge, actions, and conduct during the earthly life to ensure a future existence in the spirit world, where everlasting life was the reward of the good and annihilation the fate of the wicked, thus showing that the belief in the existence of a future life was ever before them. Various qualities, though primarily considered a manifestation of the Almighty, were attributed each to a special god who controlled and typified one particular virtue. This partly accounts for the multiplied numbers of the Egyptian gods, and with the further complications that resulted from invasions and the adoption of alien beliefs, the religious philosophy of Egypt is not easy to follow, and is often seemingly contradictory; but when we take into consideration the vast period during which this Empire flourished it is natural that the external manifestations of faith should have varied as time went on. A knowledge of the life, death, and resurrection of Osiris is assumed, and his worship in association with Isis and Horus, although not necessarily under these names, is continuous. Horus is frequently alluded to as the god of the ladder, and the mystic ladder seen by Jacob in his vision, and the ladder of seven steps known to the initiates of Egypt, Greece, Mexico, India, and Persia will be familiar to all students of occultism. 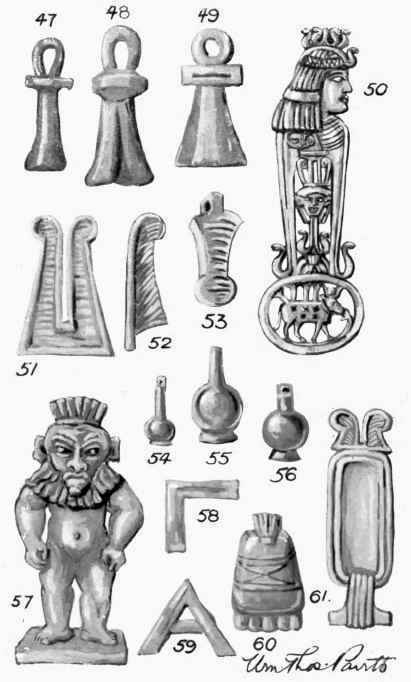 Throughout the whole of the Egyptian civilisation, which lasted for at least 6000 years, the influence and potency of Amulets, and Talismans, was recognised in the religious services, each Talisman and Amulet having a specified virtue. The Crux Ansata, Or Ankh (see Illustrations Nos. 47, 48, 49, Plate IV), was known as the symbol of life, the loop at the top of the Cross consisting of the hieroglyphic Ru (O) set in an upright form, meaning the gateway, or mouth, the creative power being signified by the loop which represents a fish's mouth giving birth to water as the life of the country, bringing the inundations and renewal of the fruitfulness of the earth to those who depended upon its increase to maintain life. It was regarded as the key of the Nile which overflowed periodically and so fertilised the land. It was also shown in the hands of the Egyptian kings, at whose coronations it played an important part, and the gods are invariably depicted holding this symbol of creative power; it was also worn to bring knowledge, power, and abundance. Again, it had reference to the spiritual life, for it was from the Crux Ansata, or Ankh, that the symbol of Venus originated, the Circle over the Cross being the triumph of Spirit, represented by the Circle, over matter, shown by the Cross.